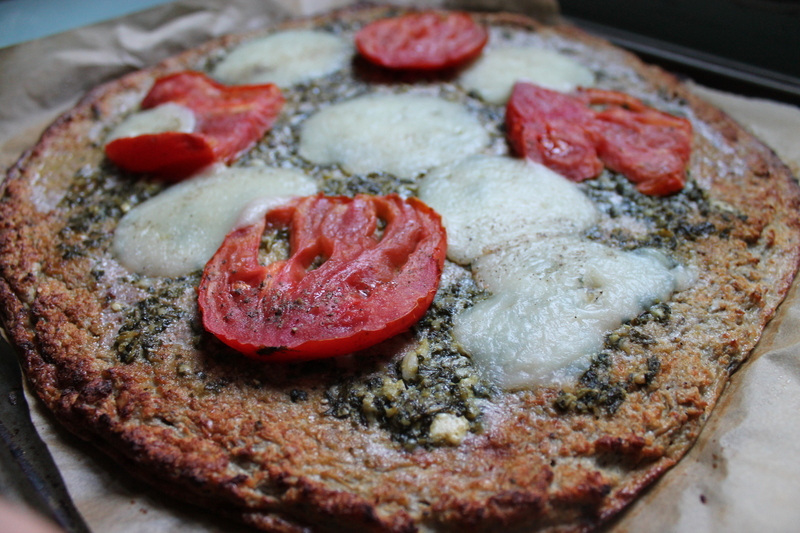 Can you believe that this pizza is absolutely flourless? 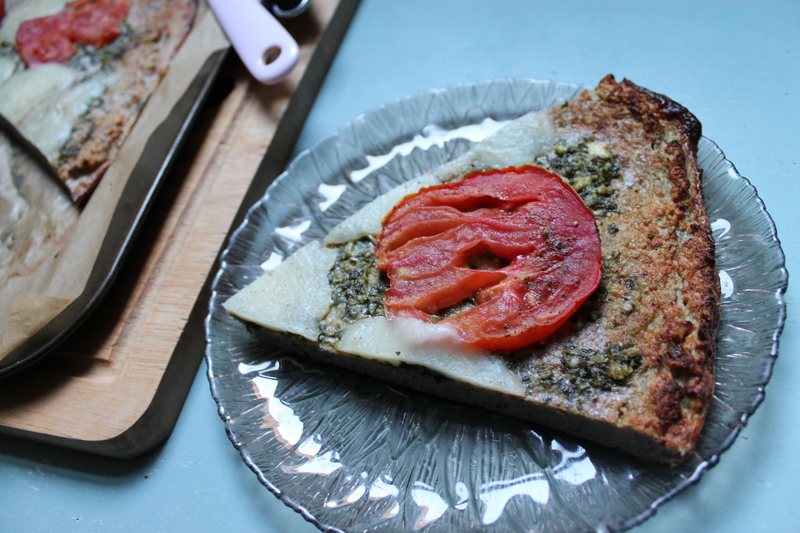 And can you believe that the crust is actually made of….cauliflower? Yes it’s true! We were trawling the foodie internet world some time ago and came across this amazing concept. We couldn’t wait to try it! And sure, it doesn’t taste exactly like regular pizza, but when you’ve got a craving, this is an absolutely wonderful substitute. In fact, it’s probably wonderful for your waistline too, so we wouldn’t feel too bad reaching for another slice! Mmmmmm. Preheat the oven to 180C (fan assisted). Put the cauliflower florets into a food processor and pulse into “rice”. Steam the rice in a sieve over simmering water. Place the “rice” into a large mixing bowl. Add the eggs, garlic, pepper, oregano, salt and Pecorino Romano and mix thoroughly into a dough (sort of). Press the mixture into a pizza shape onto a baking sheet lined with baking paper. 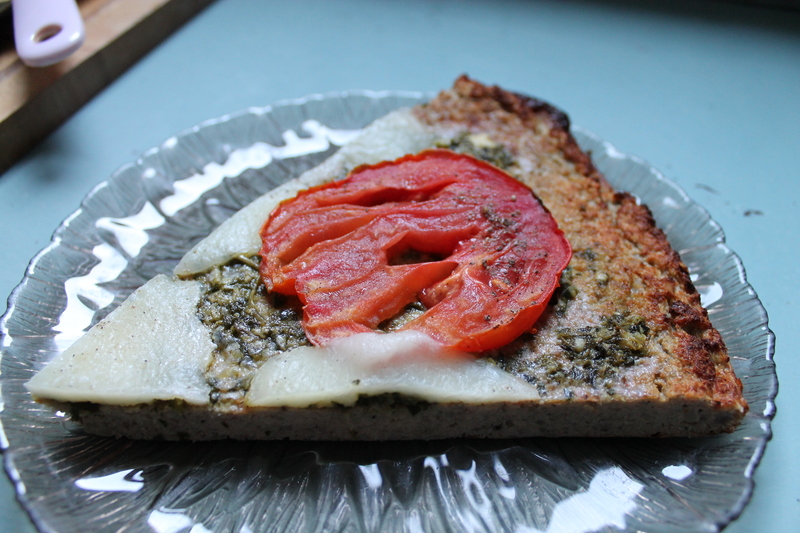 Take the pizza out of oven and spread the pesto onto the pizza. Lay the slices of tomato and mozzarella on the pizza. Bake for 15 minutes until the mozzarella is melted.